PULSE Miami Beach 2018 welcomed Miya Ando as the PROJECTS Special Commission Artist, whose immersive, site-specific installation activated PULSE’s entrance welcoming visitors down a path of discovery before they even entered the fair. Comprised of suspended, gossamer silk banners, Moonlit Clouds is an immersive installation that featured signature cloud imagery that Miya Ando photographed in Miami in 2017. The site-specific work invited meditation and interaction with visitors, activating the PULSE tent space to create an experiential entry into the art fair. PROJECTS Special Commission supported by PULSE’s Official Shipping and Logistics Partner, TBS Tramo, Inc. Mobile pharmacies are the main source of medicine for many Haitians. Street vendors carry spires of curved cardboard covered with pills —painkillers, antibiotics, Viagra knockoffs, condoms, abortion pills and cough syrups. Artists Jana Cruder and Matthew LaPenta’s installation Natural Plasticity beckons viewers to examine their own roles and relationships with disposable plastics and the environment. The title references the adaptability of an organism to changes in its environment or differences between its various habitats, existing in or caused by unnatural additives; the changing of our natural environment due to the impact of disposable plastic. Looking back at the impact of the choice of disposable plastic. 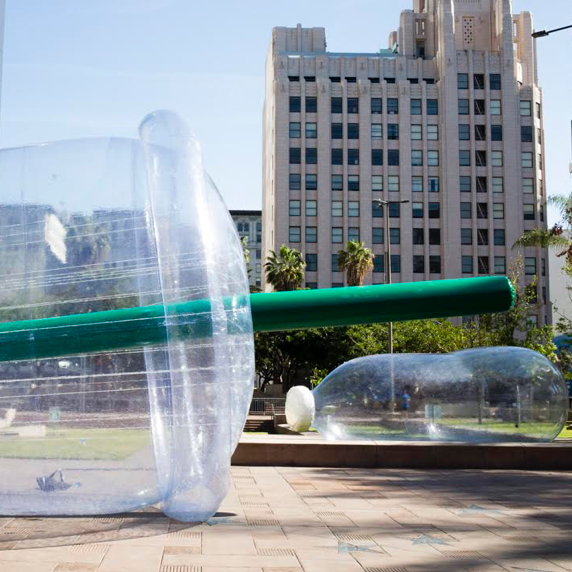 Made out of post-consumer plastic and representative of a single American consumer’s use of disposable plastic in 1 year, these larger than life inflatable art sculptures are part of a traveling series of trash aimed at engaging public participation encouraging activism through art. Rotating Moon is an open air, outdoor project with the sublime Miami Beach ocean view as the backdrop. Thomas Broadbent has created this installation with an illusion of the globular body of the moon hovering above the sandy beach surface, slowly rotating in space. Projected on a large circular screen, the image of the moon rotates a complete 360 degrees in a 1.40-minute continuous loop. This allows the observer to view the moon in a new way, as the moon turns, the so called dark side of the moon comes into full detail in a seemingly 3-D form. Multidisciplinary artist Rebeca Raney creates Ghost Garden, a suspended, maximalist installation that will act as a site for visitors to gather, pause, and connect. Drawing from 1980s American malls, vintage Hermès ads, South American markets, and recent trends in contemporary art and installation, Raney combines sensations of abundance with her own detailed and idiosyncratic imagery. Hand-painted Crêpe de Chine silk makes up the primary material of Ghost Garden, lending a focus to tactility, color, and scale ranging from large, architectural gestures to intimate details of ghosts, flowers, and other characters. Activated by airflow in the tent, the installation reveals waves of movement as the loose components shift and wave, evoking a suspended garden. One in Five of Us represents the statistic that 20% of American women will be raped in their lifetimes. The advent of the #MeToo Movement has been powerful in illuminating this horrific reality in a largely abstract yet public space. With this work, Lewis offers a palpably violent moment of physical consciousness. Visitors wereinvited to step within the installation and explore. node-558 is a media installation for CRT television monitors, palm trees, and live electronics. The project was inspired by ideas of remoteness and connectivity in the golden age of pirate broadcasting. In Pink Privacy, the women of the NY FEM FACTORY invite you to their most personal refuge. An installation where you’re beckoned into the inner spaces of the artists. Taking in hypnotic ambient music, have a seat and listen in on a phone call: inspired poetic recitations while you bask in a neon glow beneath a sprawling tree. Right now when everyone’s privacy is imperiled, women must have the right to express and create without intrusion. NY FEM FACTORY welcomes you to experience the uncensored female voice that is Pink Privacy. Performance took place throughout the day on Thursday, December 6. Sweet milk in the badlands looks toward ritual, storytelling, and trance in search of the connections between landscape and selfhood, place and disturbance. This series approaches landscape as integral to the understanding of both history and the present. Throughout the photographs — landscape works and environmental portraits — an uncanny cast of "haints," or spirits, leads the viewer through the beginnings of an epic tale that animates the land as a guide and witness. The collection of works considers the ways that land operates as a protagonist and considers each apparition that inhabits its terrain as a bridge between today's lived realities and the long history of the rural American landscape. The series was developed in North Florida and in Western Tennessee where the artist’s family lives. Allison Janae Hamilton. Sweet milk in the badlands, 2018. Archival Pigment Print. Dimensions variable. Courtesy of the artist & ArtLeadHer.